All the little children here in Boise have been wishing for some Christmas Snow...but alas, it looks like an endless stream of cold days with sunshiney skies. (Well, along with the inversion!) But in the spirit of all things fun and hopefully adorable, I created this card that I think exemplifies the excitement for the first snow. The image is another adorable Mo Manning digi stamp. She reminds me of my grand daughter with that happy little face. More details and items used are available below. I am entering this card into 2 challenges. Your card is super cute. 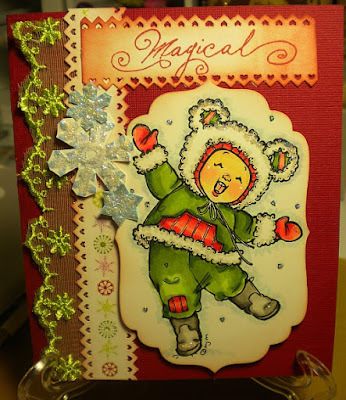 Thanks for sharing, Johanne L.
very pretty card, Shelley, gorgeous colouring! thank you for joining us at Mo's Challenge!